The Highlander has advertising opportunities across multiple platforms: Print, Web & Social Media, and Video. Whether it's a simple classified ad or a full page spread, take a look at the opportunities below to find what suits your needs. The Highlander has three major print publications: A weekly newspaper, a bi-monthly Real Estate Guide, and a yearly Handbook. All three are distributed throughout the county with 8,500+ copies delivered completely free. In addition, these publications exist electronically and are featured on our website and in our newsletter. For an example of these publications head to the Download Section to take a look at our award winning work. The Highlander provides advertising opportunities on our social media and web site. 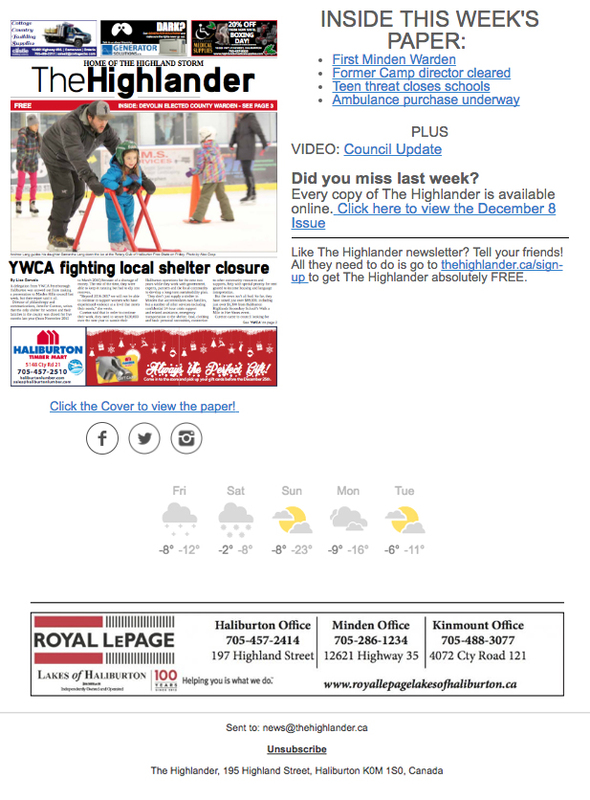 Banner ads are available for featuring at thehighlander.ca, or social media posts can be commissioned for our facebook page. In addition, ad space is available in our NEW Thursday morning newsletter subscription service. To view our content, take a look at Facebook, Twitter, and Instagram. You can also find a demo image of the newsletter here. The Highlander aims to produce roughly two videos a week, that get published on social media and our website. At the start of each video is a commercial that is guaranteed 500+ views. In addition, The Highlander produces 'Business Spotlights' which are full length videos that feature your business and employees. To check out some of our work, take a look at our video feed on Vimeo or Facebook. The Highlander now offers advertisers a 'Smart Marketing' package that features exclusive advertising space across our various mediums for a reduced price. The package is built to suit the needs of your business, and you will work closely with The Highlander Team to achieve specific goals. Our team has experience in social media marketing, advertising and web design, video production, and more! Click here, or the photo for a detailed breakdown of Smart Marketing. The Highlander occasionally has sales and offers for discounted advertisement space! Subscribe to stay up to date with the current active sales.